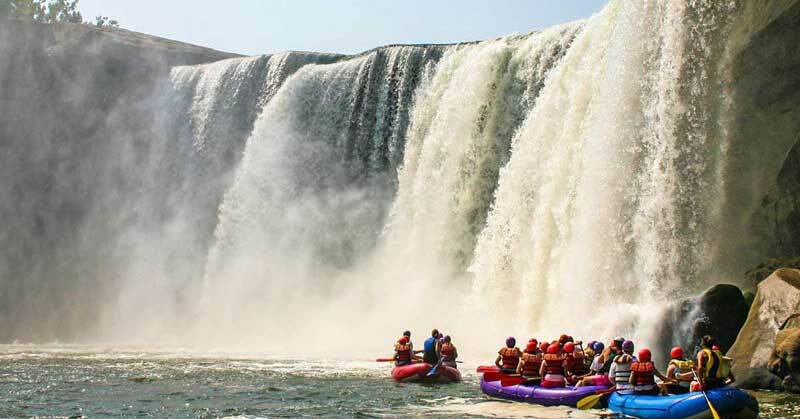 ...travel adventures with a twist of history! 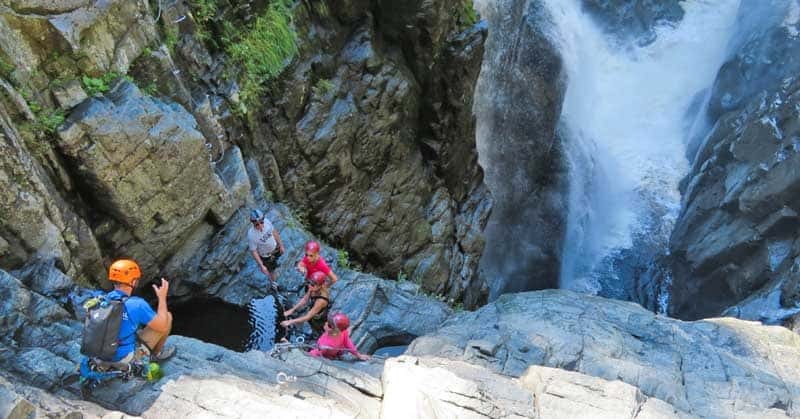 Whether you arrive in Churchill, Manitoba, by plane or train–or snowmobile, during the winter months, you’ll find this off the beaten path destination has many extraordinary adventures in store for you. Churchill isn’t the easiest place in the world to get to, indeed some might say it’s pretty tough since you really do have to fly or take the train. 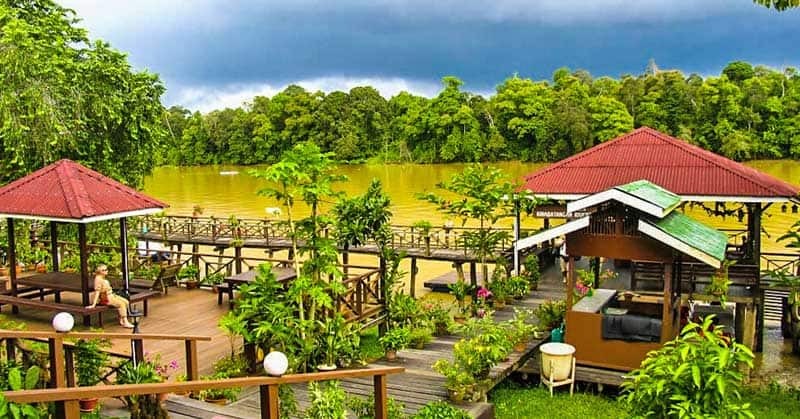 However, it welcomes visitors year-round! What Does it Look Like in Churchill, Manitoba? 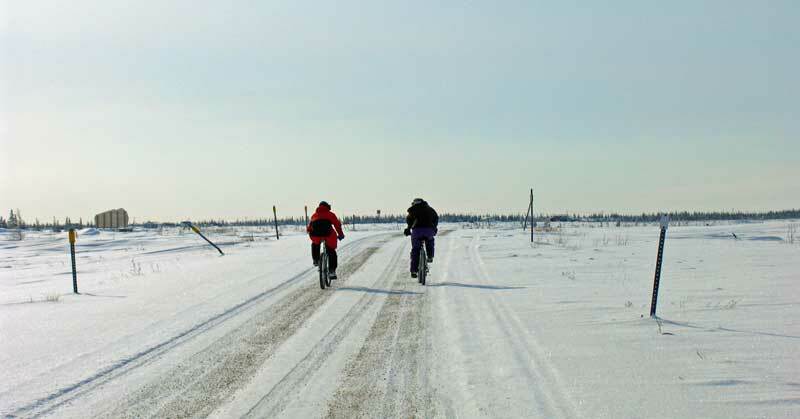 Two children cycling on a local road in Churchill, Manitoba, in March. The treeline is in the distance. I live in the snow zone, but Churchill still amazed me. When I arrived in March, it was white everywhere. Back home, on the prairies, we get snow, but it doesn’t stay white long. Instead, the snow blows, picking up field dirt, and makes our drifts more dirty gray than white. Churchill, however, had pure white snow that sparkled in the sunshine, and a sky so blue it seemed like I was looking up at an artificial dome of some sort. Of course I knew that Churchill was on the treeline. However, standing on the flat, flat snow in the town and seeing what looked rather like a hedge someone had planted far off in the distance, was still a surprising sight. Even more surprising were the little ice hummocks on Hudson Bay, that had pushed up as the water froze below—they seemed to be beautiful carvings rather than something nature had created. Can You Go Dogsledding in Churchill? Dogsledding in Churchill, Manitoba, with Wapusk Adventures. While dogsleds aren’t used for day-to-day transportation in Churchill these days, visitors can experience this traditional mode of transportation over the snow with a couple of different outfitters. I’m all about adventure, so going dogsledding was high on my list of things-to-do. A visit to Wapusk Adventures though, is more than just a sled ride–it’s a visit to a replica trapper’s camp. After the ride, we were even served a trapper’s afternoon lunch of fried caribou! How Do You Drive a Dogsled? Our visit started by learning about the dogs and how they’re cared for and trained. Each dog has a place on the team, which can consist of six or eight dogs. Wheel dogs, those closest to the sleigh, take the heaviest part of the load. Lead dogs are the opposite, being in front and setting the pace. In between are the swing or point dogs that help turn the team, and the team dogs that keep the pace steady. Easy-peasy, right? Well, it is if you know how to steer them, because there aren’t driving lines like there are with horses. 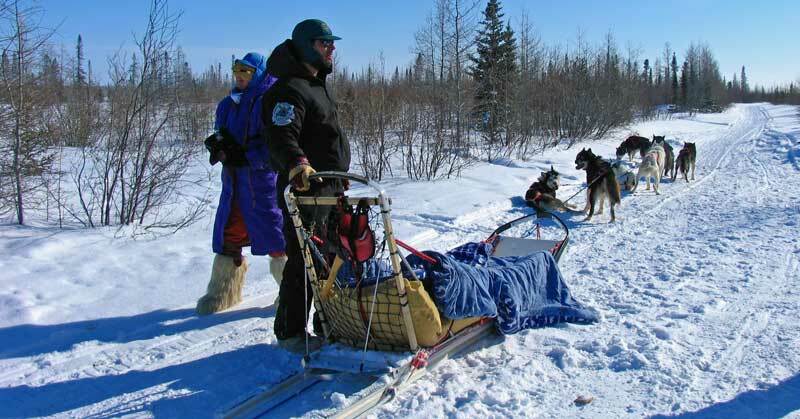 Instead, the dogs are trained to voice commands, so it’s all up to the musher (person standing on the back of the sleigh driving the team) to keep things together. And I did just that standing on the runners behind the sleigh and yelling, “Gee (right)” and “Haw (left),” to follow the hard packed trail. In the enormous northern silence, the only sound after that was the swoosh of the steel runners sliding over snow. Stone ruins of Fort Prince of Wales in Churchill, Manitoba. 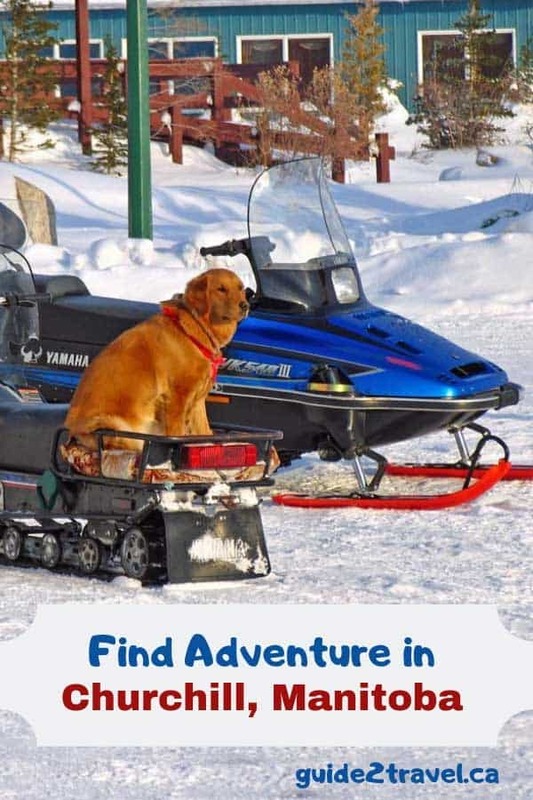 While I loved dogsledding, I was also pleased to find snowmobile rentals available from Gyrfalcon Arctic Expeditions when I visited. Better yet, we were able to head across the Churchill River to see the historic Prince of Wales Fort. The ruins, I discovered, were from the stone structure started in 1731 to replace the earlier wooden structure. On my visit, snow covered what remained of the stone walls, although it was easy to make out its square shape. It must have seemed enormous to the locals at the time, since its sides were 300 ft (90 m) long and walls 20 ft (6 m) tall! I couldn’t even imagine the 42 canons that had been mounted on the walls–and wondered if they’d ever actually been fired. 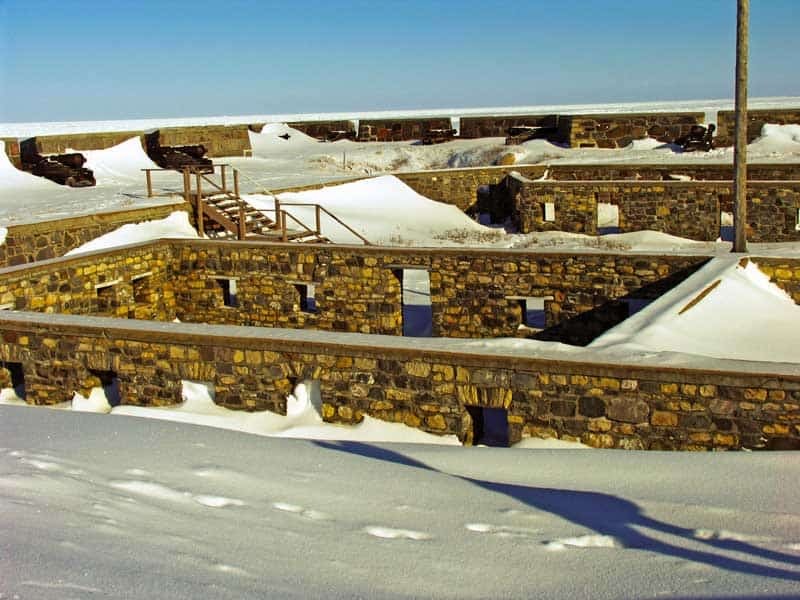 While men served at the Fort throughout the fur trade era, it was never truly completed. 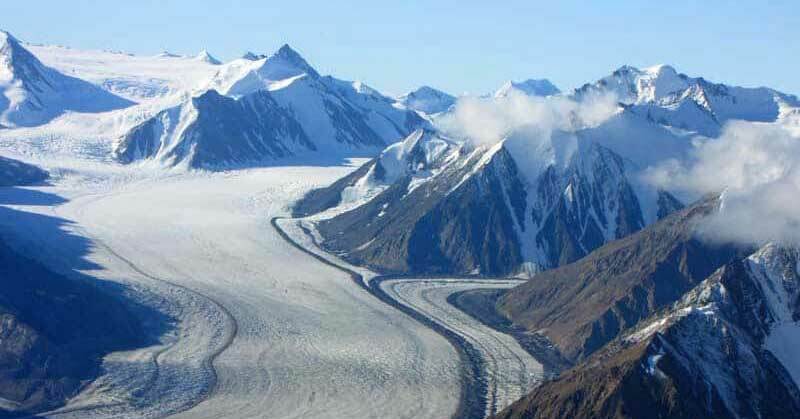 In 1920, it was designated a National Historic Site of Canada. Tundra buggy in Churchill, Manitoba. Photo copyright: Travel Manitoba. A tundra buggy is an all-terrain vehicle built large enough to protect passengers from polar bears. In fact, scooting along at nearly 30 mph (45 kph), it feels like riding in a mobile home with giant wheels! The wheels truly are enormous, with tires that are 5.5 feet (1.7 meters) high and 3.6 feet (1.1 meters) wide. In March, when I visited, the polar bears weren’t back to their summer habitat. 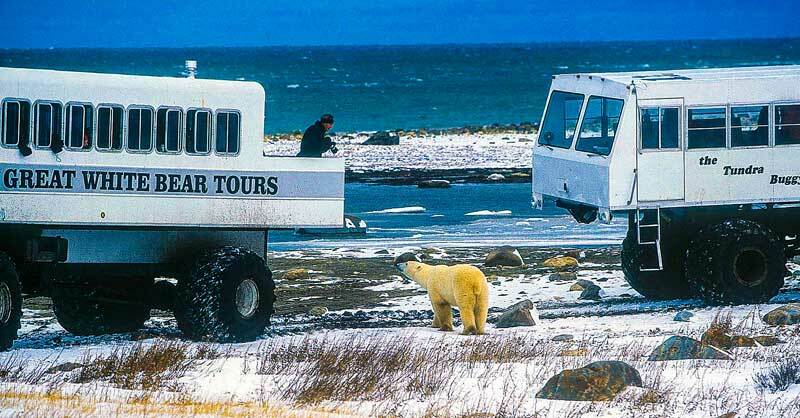 However, thousands of people take the opportunity to travel in a tundra buggy and see polar bears in the wild during peak season of October and November, plus when the spring thaw arrives. While I haven’t seen live polar bears (yet! ), these Lords of the North can grow to more than 600 kg (1,320 lbs) and stand 3.05 metres (10 feet) tall. But a lack of wakeful polar bears didn’t keep me from enjoying a cruise over the tundra in a tundra buggy. Rather than looking down we were looking up to the skies, waiting for the Northern Lights. While I’d seen them plenty of times in Southern Saskatchewan, they’re usually just dancing white lights–in Churchill, though, the brilliant emerald greens and reds were spectacular. 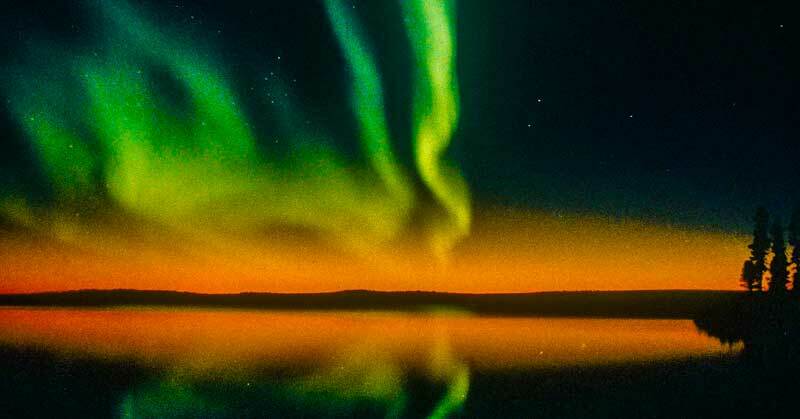 Where Can You View Northern Lights in Churchill? Northern Lights in Manitoba. 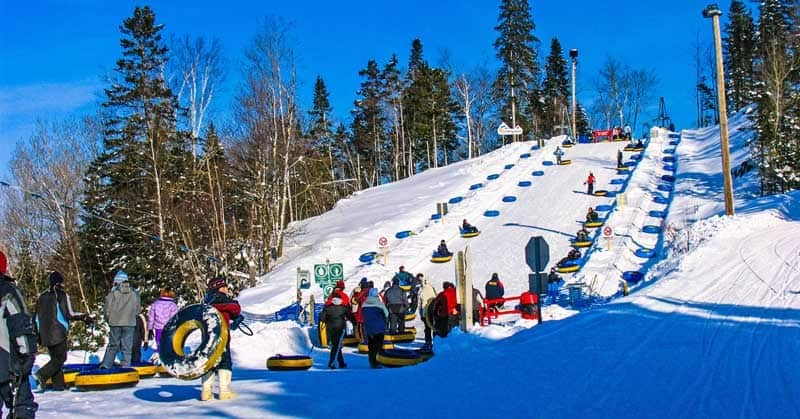 Photo courtesy: Travel Manitoba. A tundra buggy adventure is just one way to see Northern lights when you’re in Churchill. Another, much cozier way is to spend a night at Aurora Domes–a domed building designed specifically for watching the night skies. The dome is a twenty minute ride outside Churchill, in order to provide a setting completely free of light pollution. Transportation is available from local hotels to make it easy to visit–book early as the seats fill up quickly. Here’s a video from Travel Manitoba to give you an idea of the experience before you plan your trip. Once you get to Aurora Domes, you’ll find lots of information to explain the aurora borealis or Northern lights. The staff are knowledgeable too, and ready to answer questions. Viewing is comfortable in the second floor circular domes, as you can lean back, relax, and watch the lights dance! Itsanitaq Museum in Churchill, Manitoba. I couldn’t resist the glorious day with temperatures just below freezing, so immediately set out for a walk around town. First stop? The Itsanitaq Museum to learn more about Churchill’s history and landscape. Churchill sits on the Western shore of Hudson Bay, homeland of the Hudson’s Bay Company that started the early fur trade. Indeed, in 1670 the British granted all the lands of the Hudson Bay watershed to “the Governor and Company of Adventurers of England trading into Hudson Bay.” That history is part of the information you’ll find in the museum. Centuries before the fur trade, though, Indigenous peoples used the area as a hunting ground. The museum has displays of some of their oldest carvings and artifacts, dating from Pre-Dorset (1700 B.C.) through Dorset, Thule and modern Inuit times. 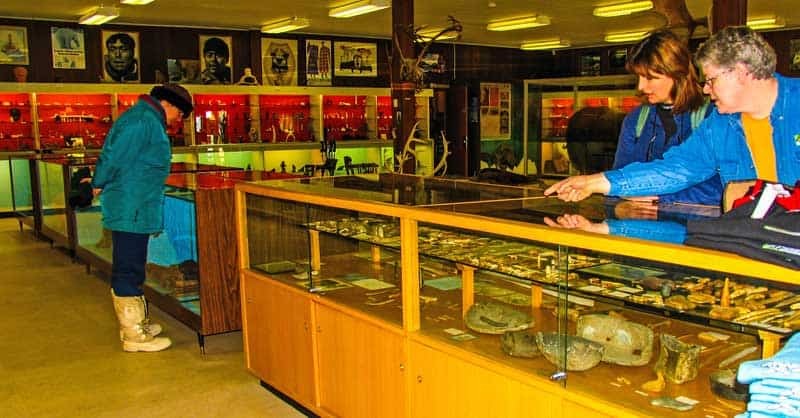 Open year-round, the museum has lots to see from the preserved musk ox and polar bear to the priceless whalebone and soapstone carvings. There’s also a gift shop where you can purchase Inuit art. An inukshuk in Churchill, Manitoba. One of my favorite ways to explore a community is by walking through it. And I found there was lots to see on a walk around Churchill, Manitoba, starting with inukshuks. What’s an inukshuk (also inuksuk)? Simply put, it’s a pile of stones stood together to serve as a landmark. 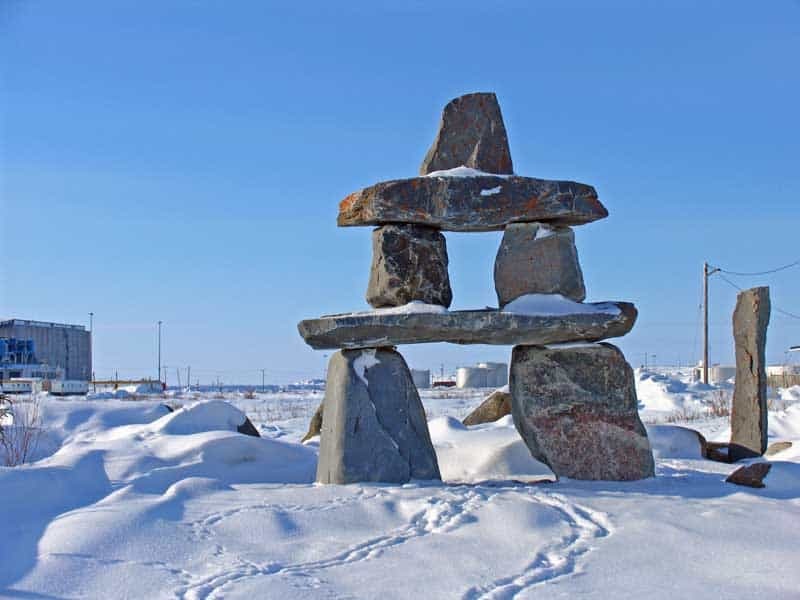 Many inuksuk have a human shape to them, so it seemed they could almost come to life and walk the winter landscape. 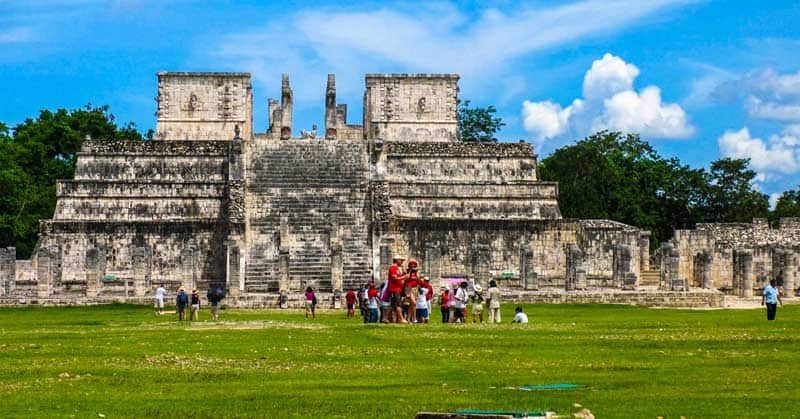 In centuries gone by they were important to the Indigenous peoples as roadmaps and post offices, as well as being part of the spiritual culture. Local artisans at the Arctic Trading Company in Churchill, Manitoba. 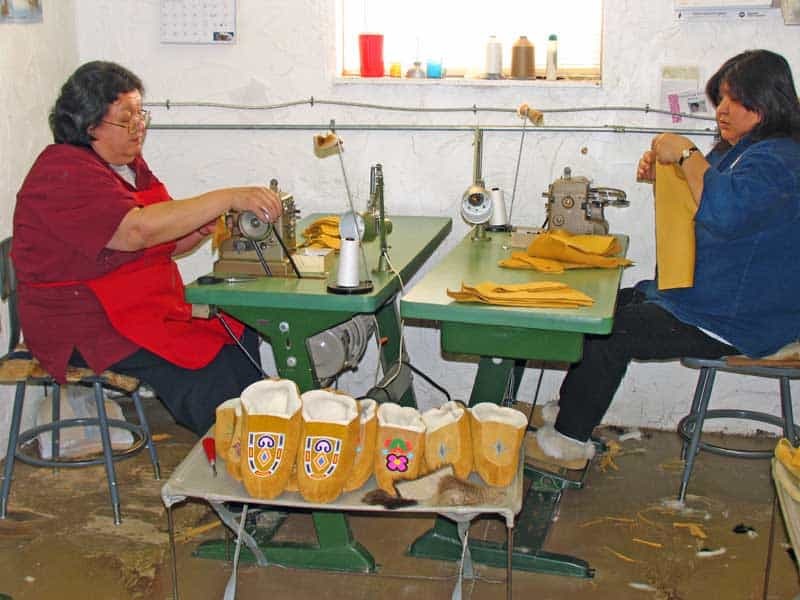 And if you’re looking for more cultural traditions, you have to visit The Arctic Trading Company store, that seemed to have everything from fur parkas to hand-crafted moccasins and artwork. The neat thing about the Trading Company is that you can watch the local artisans at work. I couldn’t resist stopping to chat with some of the women, who managed to answer my questions while their busy fingers worked away. I visited Churchill, Manitoba, as a guest of Manitoba Tourism, on an Urban Nights and Northern Lights Press Trip for travel writers. The Inglis Grain Elevators National Historic Site at Inglis, Manitoba, provides examples of the prairie giants that once were the icons of Canadian plains. 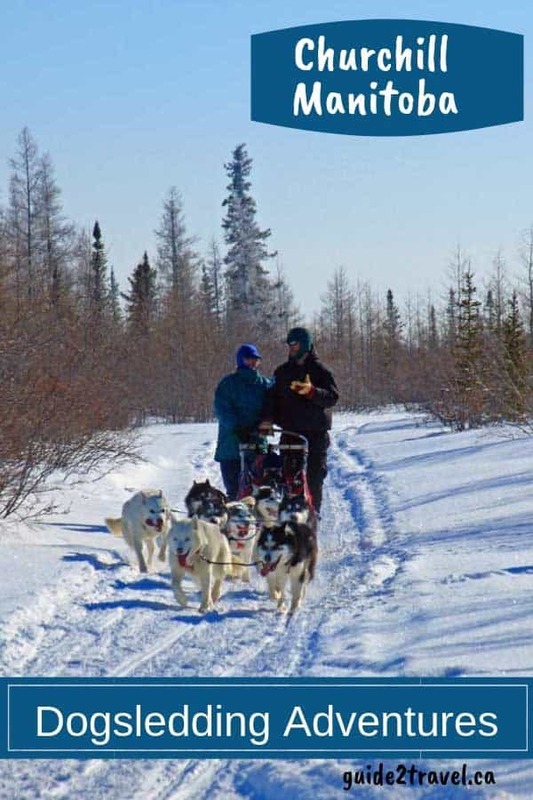 Churchill, Manitoba, has amazing adventures during the winter, with experiences from viewing the Northern Lights to riding in a tundra buggy to dogsledding. 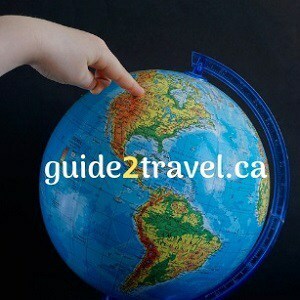 Visit Gimli, Manitoba, to enjoy The Icelandic Festival of Manitoba celebrating its Viking history annually in August! However, you’ll find “New Iceland” has lots of authentic Viking culture year-round. No matter what you you’re looking for in a romantic weekend getaway, you’ll find the perfect destination in this list of romantic cities in Western Canada. 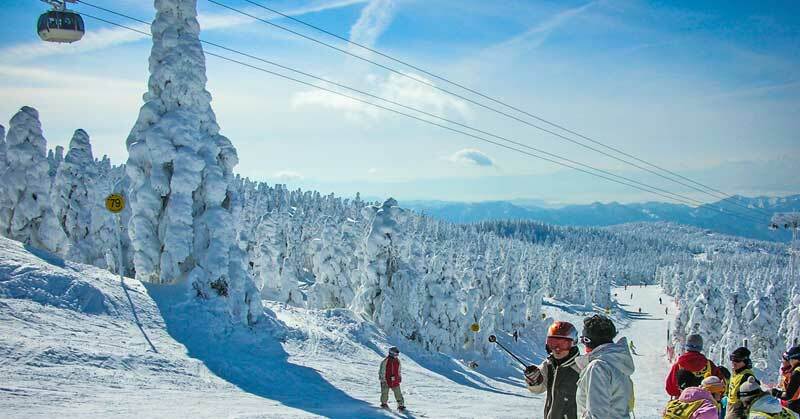 You’ll find everything from ballet and fine dining to skiing and the spa. The Whytewold Emporium near Gimli, in Manitoba’s Interlake Region, serves wood-fired pizza and French crepes — along with a garden centre and store. 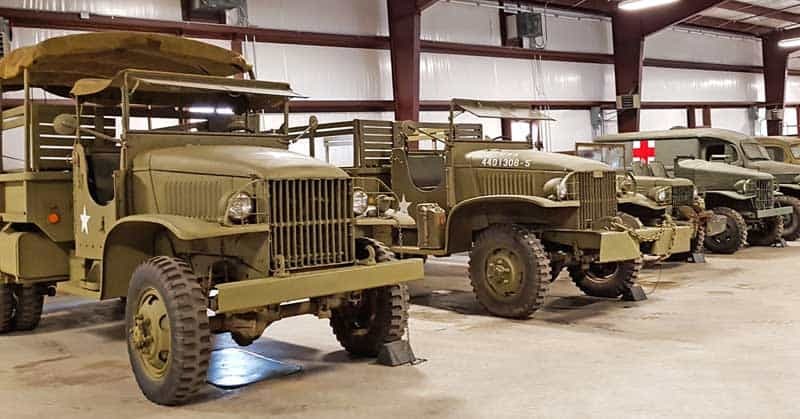 It takes just 1000 miles from Winnipeg, Manitoba, to Edmonton, Alberta, with stops in Saskatchewan, to explore Western Canada’s 8 best open air museums. Spring in Canada is a season of renewal after the winter dormancy. 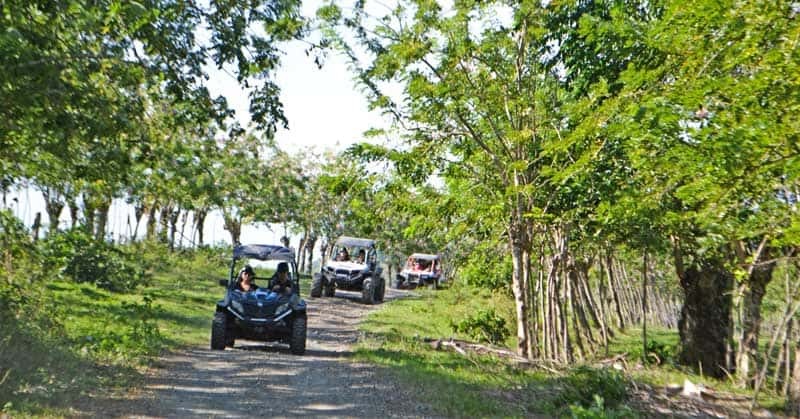 And while we wait anxiously for the green grass, the buds that will turn into leaves, and the first crocuses on the hillsides, few anticipate the return of snakes crawling out of the rocks. Why Were the Carberry Sandhills in Manitoba Important in WWI and WWII? 100+ Miles Per Hour Just Inches Off the Ice–Oval Snowmobile Racing! The photo in the header above was taken dogsledding at Wapusk Adventures in Churchill, Manitoba, Canada. Hi Linda! 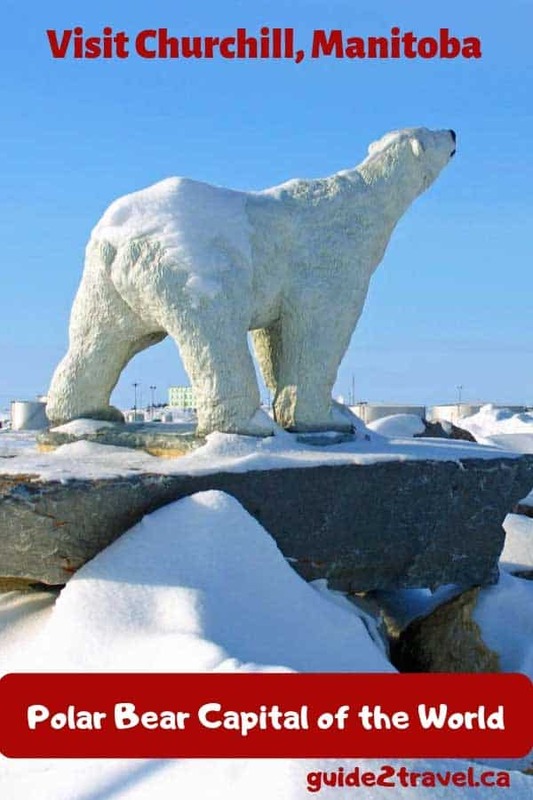 Great overview article of visiting Churchill, Manitoba. 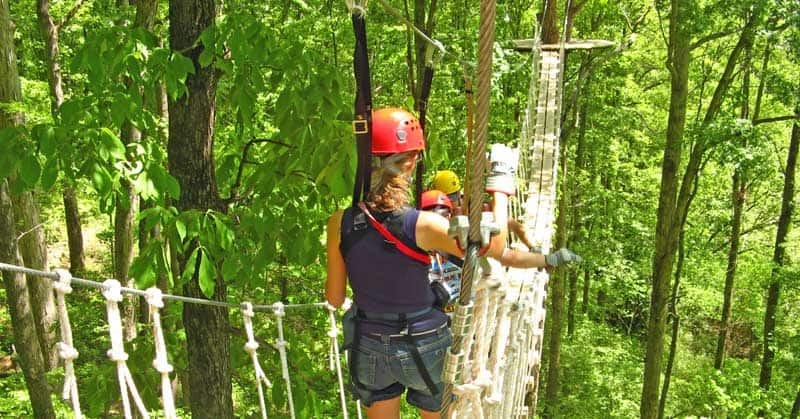 I’ve had the privilege of being up there 6x in all four seasons, so can really share your excitement for this unique destination. You were fortunate to have mild weather on your visit. It was -66C with the windchill when we went dogsledding. The males leave Churchill and go out onto the frozen ice to hunt seals during the winter. That is why we don’t see them. Except of course for the mother bears, who go into a den to have their cubs during the winter and come out in the spring with their new families. Thanks, Doreen! It’s been awhile — come to think of it, they did talk about the males leaving the area. 🙂 I would love to visit during the summer season.